To the outside world, Barbara Harrison had it all together: A good job in the real estate industry and a stable family life. But some unfortunate choices led her down a path of drug addiction and into the firm grip of incarceration. “It got to the point that I could not deal with myself any more,” Harrison told a crowd of several hundred at the April 4 “Second Chance Breakfast” sponsored by Offender Aid & Restoration (OAR). By the time she arrived at OAR’s doors to seek help, “I was frustrated, angry and unable to find a job,” she said at the forum, held at the Sheraton Pentagon City Hotel. Harrison’s decision to seek help led to new employment . . . and a new perspective. 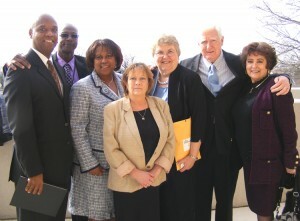 Founded in 1974, Offender Aid & Restoration works in Arlington, Alexandria and Falls Church with support programs for those in jail and prison, and assistance when they return to life outside a cell. The recidivism rate among OAR clients is 8 percent, far below the national percentage. The annual breakfast fund-raiser drew a heavy turnout from elected officials and law-enforcement personnel, as well as Harold Clarke, director of the Virginia Department of Corrections. U.S. Rep. Jim Moran (D-8th) noted that one in 31 Americans is in prison or jail, or on probation or parole. Perhaps the most important support needed for those coming out of incarceration is a job, and OAR’s event spotlighted several local companies that are willing to hire those with criminal records. Among the firms saluted was Miller & Long Concrete Construction, which for the past eight years has lent a hand to those coming out of the criminal-justice system. About 100 ex-offenders are part of the organization’s 2,500-member workforce. Honored at the ceremony was Judge Karen Henenberg, who is retiring after service on the General District Court. Also saluted was Gov. McDonnell, for efforts during his term in office to support ex-offenders and those who support them. In a video message from Richmond, McDonnell said he has pressed for effective re-entry programs for offenders. “OAR has been a big part of this initiative – OAR is making a big difference in the lives of its clients,” the governor said. Arnall said OAR’s goals for the near term include the hiring of a family-relations specialist, establishment of a permanent presence in Alexandria and building relationships with the business community. The annual Second Chance Breakfast brings in about $85,000 to support the organization’s goals. For information, see the Web site at www.oaronline.org.